The Food: Pork Tenderloin Roulade with pineapple and grapes. 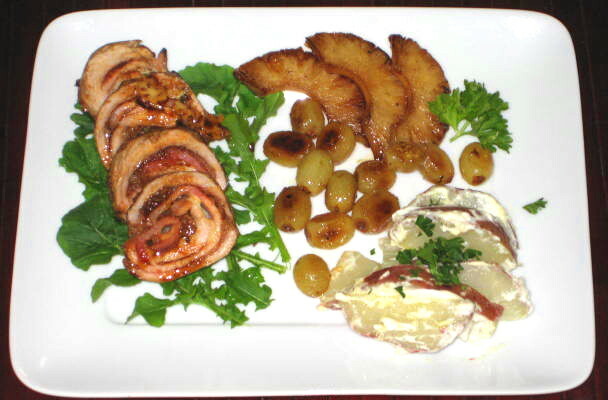 Pork Tenderloin Roulade with pineapple and grapes. Today I have challenged myself to come up with new creation based on very first piece of meat that I see in the freezer. 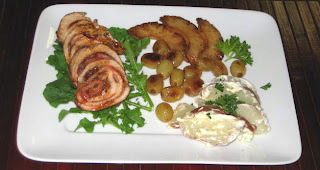 As my luck would have it, it was a 5” piece of vacuum packed pork tenderloin. Small piece like that would have to have few things added to it so my plan was to create some sort of roll. Part of the challenge was to use what was in the fridge or pantry only and since I still have parsley, chives and arugula growing in my cold frame it was OK to use. Preheat oven to 375 °C. Cut up potatoes and start boiling on medium heat. Once the water starts to boil it will take about 12 minutes to be ready. and pound it till about 1/8” thick. Spread onions on pork, sprinkle with hot paprika and cover with bacon slices. Place cheese about 2” apart so that each layer of the roll will have cheese in irregular pattern. Roll very tightly and tie with butcher’s twine about every 2”. Heat frying pan, add oil and brown the roll on all sides. Place in preheated oven and roast for 15 minutes turning once halfway through roasting. After 15 minutes remove from oven, cover with aluminum foil and let rest. When you put the tenderloin into oven start caramelizing the pineapple and grapes in 1 T. of butter. In about 5 minutes check for dark brown marks on bottom and turn over both pineapple and grapes. The judge at table called it a winner and definite repeat. Saying that, she said that it would be nice to have more of the pineapple, though.